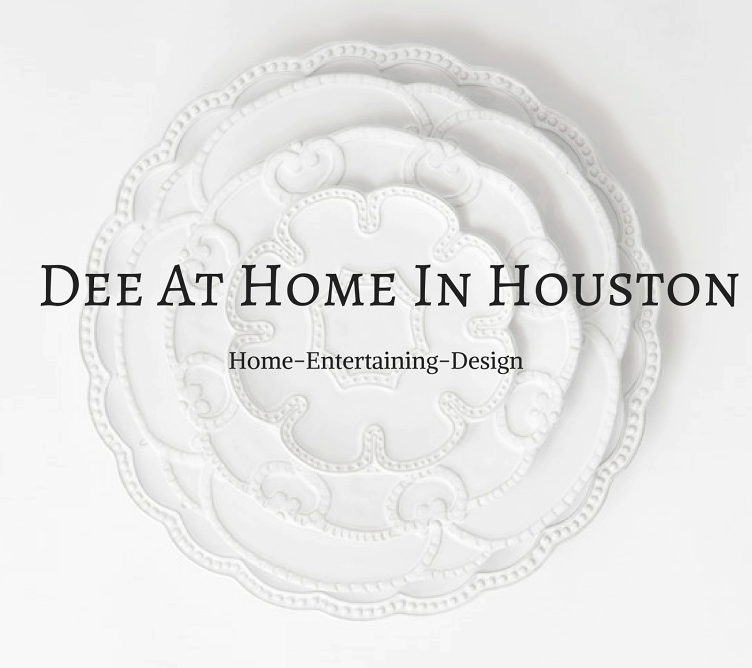 Dee At Home In Houston: How To Throw A Stylish Baby Shower At Home! How To Throw A Stylish Baby Shower At Home! I'm honored to be the host of a baby boy shower at my home. I have to admit that baby showers are my very favorite parties to host! There is something about letting my inner child loose that feels uplifting. The thought of a baby growing in a mothers body is the most amazing miracle. As adults we often feel pressure to be a 'grown up'. We must put away the gingham checks and baby pink blankets and take on the greys and blacks that make us look skinny or compliment our skin tone. So I'm just thrilled to be able to toss aside all the grown-up rules and celebrate my inner child and the miracle of life! So, without further ado, lets get started! First, times have changed and we no longer have to choose blue and white for a baby boy shower. The possibilities are endless! I think the number one mistake that people make is going to the local craft store and perusing the baby shower theme items. Instantly you are bombarded with THEMES! Sure, some of them are cute. I love the cute lumberjack theme for boys. And then there is the classic...It's A Boy! in blue and white. Been there done that! Right now the Fox and Elephant theme is EVERYWHERE. My advice is to stay away from that area until you have come up with your own idea. This way you don't get tunnel vision. It's very hard to come up with your own ideas if you are bombarded with other peoples ideas. So where did I start for inspiration? With mom. I had a good talk with her and she was decorating the nursery with baby animals. She also had a picture of yarn that her mother was crocheting a blanket from. So, I asked for a picture of the yarn and the invitations she liked. That's it. That's all it took for me to be inspired. In my mind I'm thinking stuff animals. Elephants, giraffe, lions and bears...oh my! These cute animal heads are from Hobby Lobby. Add real ribbon to your presents! You would be surprised at how much it dresses it up! I love the blue bow on the gift! Hobby Lobby has ribbon on sale every other week. I keep a stash around for just such occasions. Blue and white is very common for a boys shower. So I wondered how I could change it up a little and still have it a boy color theme? I found some great crinkle paper at my local Tuesday Morning and voila. I chose a blue, green and brown color scheme. Many people overlook that brown actually looks great with blue. And to raise the interest a bit I throw in some green in the same color palette. A soft green. Beautiful! Now I have the browns that tie into the stuffed animals and the blue as a nod to the baby being a boy. Now that I have a color scheme in mind and know I want baby animals it was time to shop! Of course, I head straight to Hobby Lobby, Tuesday Morning and HomeGoods. The rule used to be have everything match. But now we have discovered that it’s not as visually interesting as if you were to pull items from many areas. In this case, I knew what I was looking for, and focused on, two things...color and texture. I knew I could go to Hobby Lobby and get paper plates, cups and accessories that match but I thought I wanted to do something different. I wanted to take it up a notch! Every thing should flow and work together but not be exactly the same. Color is a great way to tie things together. We used blue, green, and brown! I bought these pompoms to decorate the ceiling. I rather liked them. Here is a tip. Paint your thumb tacks the color of the ceiling. I didn't have time to do that here. I also used a lot of tulle in brown, green and blue. The tulle is just a little nicer than paper streamers. Some of the tulle had glitter so we laid down a sheet to keep it out of the carpet. My next stop was Tuesday Morning. I know they have cute baby stuff and I hit the jackpot! I found these adorable giraffe chairs that were too cute to pass up! So when I was shopping I focused on items that would serve double duty. A great baby gift that would also serve as decoration. Because, lets face it, there is a significant cost for mom to decorate the nursery and get everything she needs for the baby. And my gifts, while might not seem as practical as a box of diapers, will act as decorations for the baby's room and give him something safe to eventually crawl around on. And how cute would moms pictures be with the baby propped on the giraffe chair. My next great find was at Homegoods! I found the perfect gift/prop! A lion sleeping bag! It was totally adorable and big enough to make an impact for decoration. I also was thinking that even though the baby couldn't use it as a sleeping bag right away it still would be perfect on the floor of the nursery for laying the baby on. Rug, sleeping bag, soft blanket! Multiple uses! I bought a Cricut Air 2 recently and was so excited to make the banner! I love this machine and I don't know how I ever managed before without it. On of my tricks that I use often at Christmas time is to wrap empty boxes and stick them under the tree year after year. This works well if you have a very small family or there is just two persons and the tree looks empty. 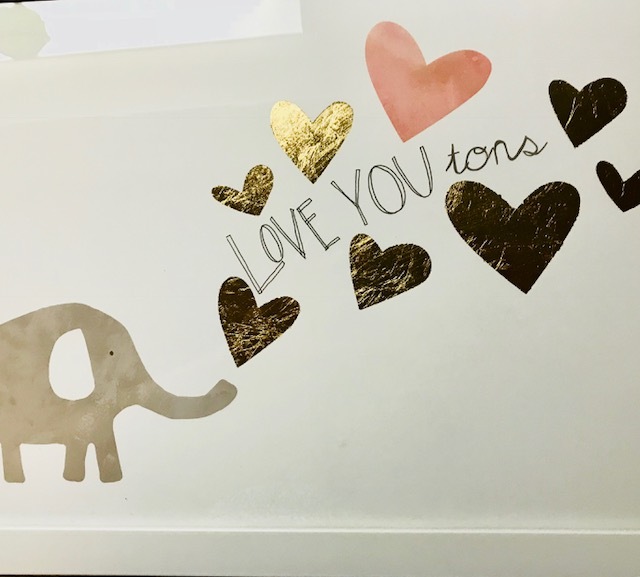 In this case I found an adorable gift bag that suited the color and animal requirements and stuffed it with coordinating tissue paper. This is the statement piece that I will use for the gift table. It bothers me to see an empty gift table. It just looks sad. Ha, it's also sad that I forgot to take a picture of the gift table! Fresh flowers are a must if you want to make a elegant party. I used the same principals as I used in my end of summer floral arrangement and added a few extras. I went to Trader Joe's and bought 1 bunch of white gladiolas, 5 bunch of blue hydrangea and 3 bunches of white tulips. The steps are easy peasy. Gladiolas in the middle surrounded by hydrangea at the base. I worked in white tulips in between the hydrangea. Then I puled some silver dollar eucalypti and white snapdragon from a floral arrangement I already had but wasn't excited about. I just tucked them in where ever there was a hole. Another easy arrangement was mixing white tulips with blue hydrangea. Super easy! Real flowers are just wonderful at breathing life and elegance into a room. I think my favorite project was the cupcake stand. I did a little research on Pinterest and was inspired to make a cupcake stand out of can food and Styrofoam disks. I used baby wrapping paper for the top, I used a little glue to keep it secure. I bought green crystal ribbon and used my double sided tape gun to secure the ribbon together. I might do a blog on how to make one! So easy and I loved propping my Hobby Lobby monkey on the very top! Hint: Make sure to glue it all together well so it does not fall over when someone gets a cupcake. I learned this the hard way...sigh. I grabbed a few sets of Bvlgari shampoo, conditioner, shower gel and lotion from a nice hotel we stayed at a week earlier and we used these as prizes for games. I highly recommend this if you travel a lot. I bought this cute picture at Hobby Lobby and took it out of the frame for everyone to sign. It came out really cute! I hope I have given you some ideas for your next party! Follow my page on Pinterest for more inspiration on baby boy showers! Dee's Table For The Last Dog Days Of Summer!